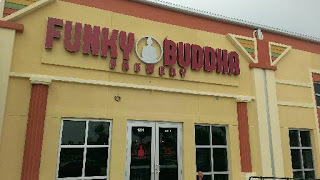 First up, the new Funky Buddha Brewery in Oakland Park FL. A number of other writers attended the Grand Opening in June and told all of us what a great place this is. I happened to be at the original lounge the week before (coming back from the Keys at that time). So, the new brewery was a must-see! Got here around 5pm or so, and there was a nice crowd, and by the time we left, they were streaming in. Plenty of places to sit and talk. In a nutshell, yeah, it's a cool place, the beer is good, and I definitely plan on getting back over here again. It's a nice place, pretty big. The ceilings are high, so I suspect it can get noisy when crowded. 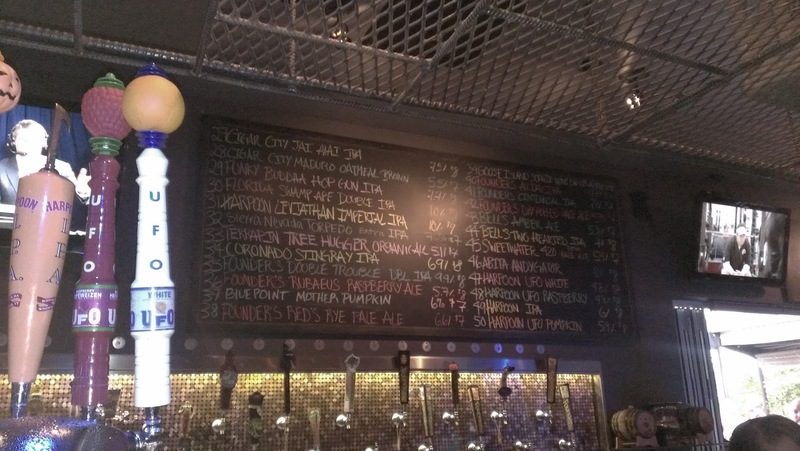 That night, the bar offered 7 of its beers and 5 guest taps. I started out with the just-tapped Missionary Blonde Ale, described as a one-malt lighter brew. While this brew likely won't appeal to the heavy-hoppy-lovin hopheads, I found it very pleasing, a crisp ale - you could drink a few of these (at least). 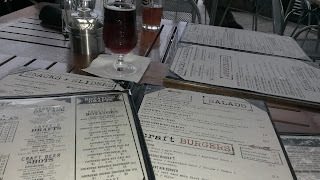 I had to try the Blueberry Cobbler Ale. The spices are prevalent, and it tastes just like a pie. Usually, I'm not into spices in beer, but this smelled like a bakery. Although I thought it was nutmeg, I was told it was cinnamon. Just like a pie crust. Overall, the brew was very tasty, and I was pleasantly surprised. However, it's more of a sipping or dessert beer, not one that you would pound all night long. I also had a Crusher Pale Ale (4.6%, 35 IBU), which I thought was also quite good. 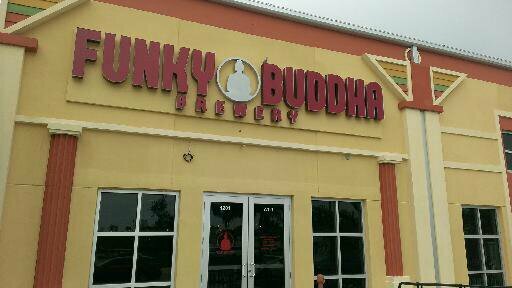 So, I finally made it to the Buddha. Really glad I did. I can't wait to go back. 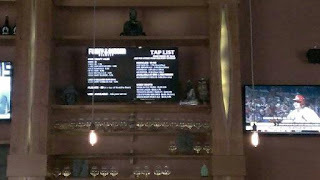 Now, time to focus on dinner, with a good beer list. 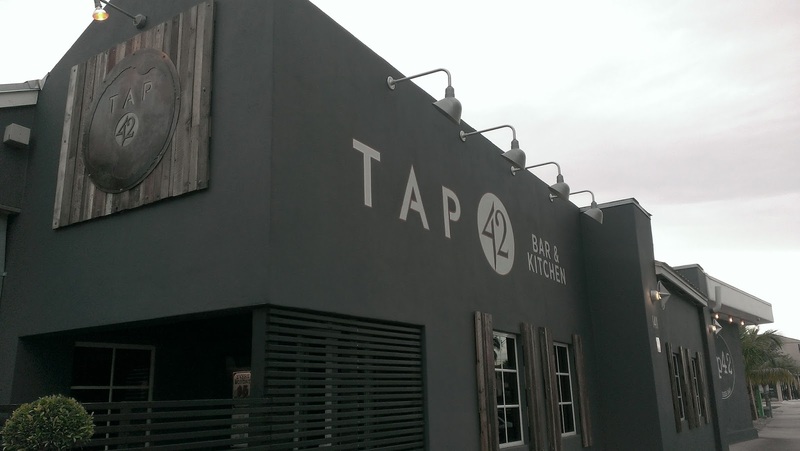 Headed over to Tap 42 in Ft. Lauderdale. Had been here in May, but decided to grab some food here this time around. Indoor and outdoor patio seating available. We chose to sit outside under the large umbrellas. Upon walking in, one of the first things you notice is the long bar with the large wall of taps! 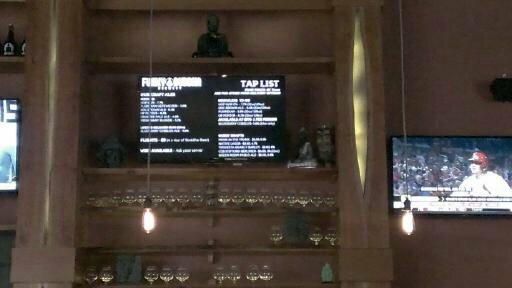 Apparently, there are 42 taps on the back wall, with additional taps just off the main set. The drafts include "core" craft drafts (non-rotating) and others that switch out. the bar also offers "lock & key" bottles, which include collabs, meads, oak-barrel and others that are described as being "non-traditional." And, they also offer "layered drafts," made by combining two beers/ciders. 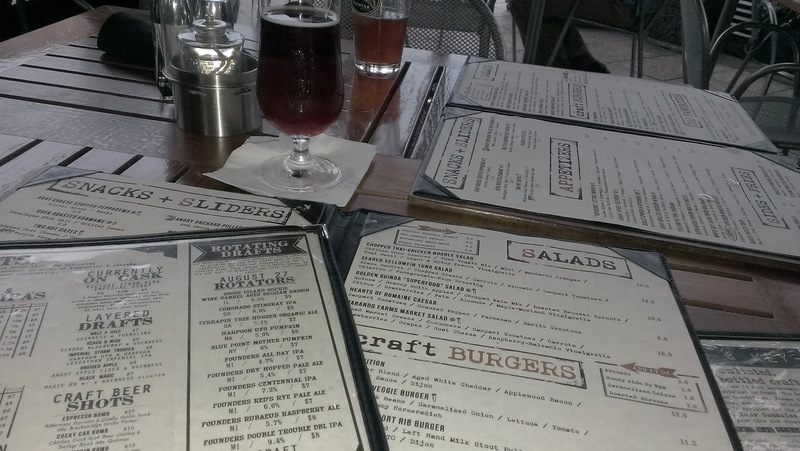 After deciding on a Founders Rubaeus at the bar, we waited just a bit for the outside table. 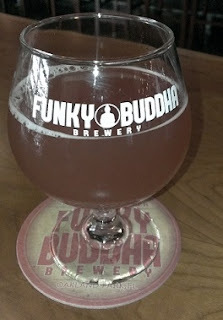 Loved the Rubaeus, by the way, which I had been waiting to try, but hadn't seen anywhere. You won't find full dinners here, but the menu offers sliders, appetizers (wraps, wings, dips, soup, salads), burgers, and fish and chips. So, what's under that bun? 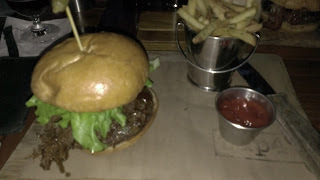 A burger, a pressed pulled short rib made with Left Hand Milk Stout, and bbq sauce. I opted for the add-on caramelized onions. A definite taste explosion. Let's just say I didn't leave hungry, and I didn't tackle the entire behemoth. 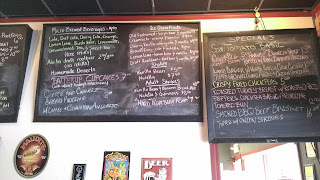 They also offer veggie and turkey burgers, and a blackened mahi sandwich. Although the patio is situated adjacent to the parking lot, it's a pleasant dining experience under the patio umbrellas. The inside dining and bar area opens to the outdoor patio, for a free-flowing layout that makes for a nice setting. If you're looking for a casual place with a great craft beer list and nice atmosphere, I'd recommend checking out Tap 42! After spending the night in Lauderdale, time to brave the stretch of pavement known as Florida's Turnpike for the trek through Miami to that gateway of the Keys, Florida City. Of course, it was raining, and Miami traffic never fails to be, well, Miami traffic. Don't know why every time I go by or to Dolphins Stadium (or Pro Player, or Landshark, or SunLife), it rains! Anyway, the rain eventually ended, and the traffic miraculously cleared up. Passed by the Mutineer, and away we go! 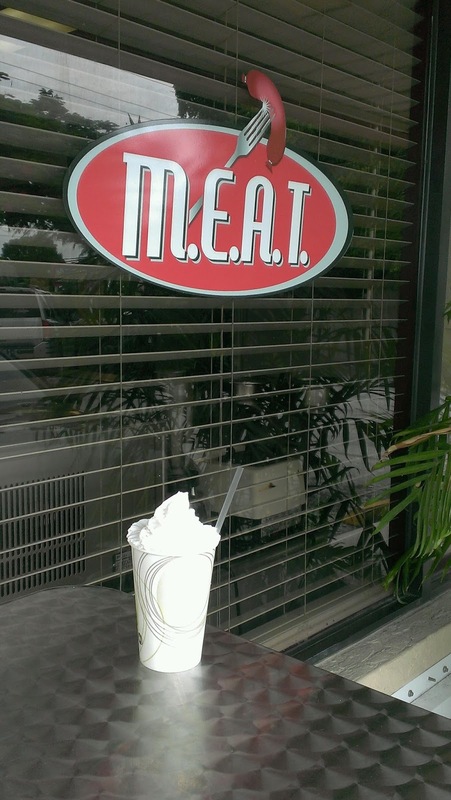 OK, I had heard about this place called MEAT that had "beer shakes." Obviously, a no-brainer to stop here on the way. Located in a small plaza at Mile Marker 88, on US 1 in Islamorada, Florida Keys, you need to be on the lookout for this place as you approach MM88. Generally, it's right across from the Marker 88 Restaurant (which, by the way, has amazing seafood dinners and great water views). 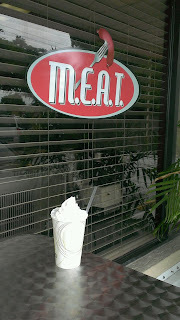 It's a small storefront, but you notice the design of the red oval, the lettering M.E.A.T., and the fork holding a sausage. So, it's a quick turn into the plaza once you see that. Enter into a diner style eatery, with a chalkboard menu posted on the wall (they have paper, too), a counter and booth seating. Now, of course, you're wondering what M.E.A.T. means: Meat Eatery And Taproom. So, there's beer, too. Actually, about a dozen on tap, including craft and domestic. Diverse selection, too (Chimay, Bell's, Guinness, Brooklyn, Affligem, Well's, Dogfish Head, and others). Wine and soft drinks served, too, even including Abita root beer on tap. The food menu includes: soup/salad, sides, burgers, sausages, pulled pork, "tube steaks," and fried chicken, in addition to lobster mac-n-cheese and lobster roll. The burgers are 5 oz. or half-pound, and you can get crazy by adding a number of add-ons. But, I went there for the beer shake! They have Vanilla Bean and Nutella housemade ice cream. As if that doesn't sound good enough! 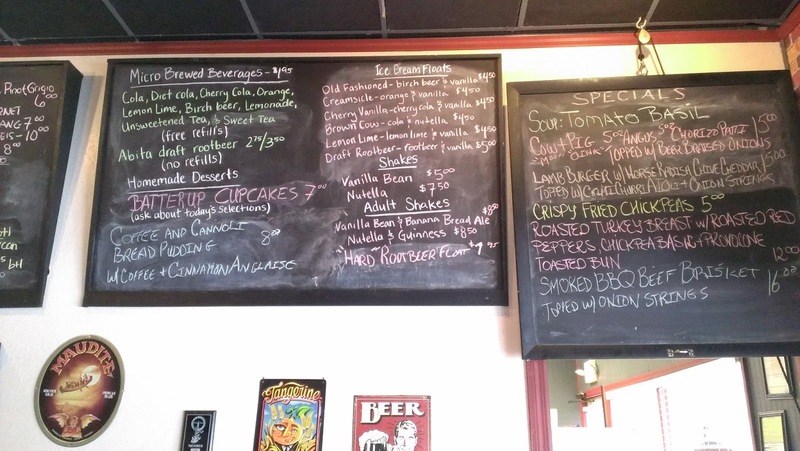 The "adult" milkshakes are made with Guinness and Nutella, or Banana Bread Ale and Vanilla Bean. They'll also make a combination, like a chocolate banana kind of thing. I chose the Banana Bread/Vanilla Bean. I hadn't had the Well's Banana Bread Ale yet (I did later on), so I was really intrigued. Four ounces of Banana Bread Ale, ice cream, and a whipped cream topper later, I had my shake, and couldn't wait to dive in. Yeah, there it is, in all its glory. It tasted like a creamy banana shake, with a touch of decadent sinfulness from the ale. The banana was just the right amount. This combination of ale and ice cream is a delight for your tastebuds. I had done beer floats before, but not a beershake. Blending the ale and ice cream produces a creamy texture that is nothing short of awesome. Well, now, just writing this, I want another one! They also make "regular" ice cream floats and shakes, without the "adult" ale or Guinness. I had planned on stopping again on the way back to try the Guinness/Nutella shake, but travel plans and timing changed, and it didn't happen. Next time through, I will stop by, no doubt about it. So, check this one out, for food, ice cream, or a beershake that will leave you ooh-ing and aah-ing for a while. So, that's it for now. More on Key West still to come: hotel, food, beer, more beer, etc. Til next time!